Beautifully illustrated, this book is a rich source of information for a diverse pool of readers, ranging from graduate students making their first steps in a new field of knowledge to more experienced scientists whose research has led them to unfamiliar grounds. C. David Allis is the Joy and Jack Fishman Professor and Head of the Laboratory of Chromatin Biology at The Rockefeller University in New York City. His laboratory focuses on chromatin signaling events related to the 'histone code'. Thomas Jenuwein is a Senior Scientist at the Research Institute of Molecular Pathology (Vienna) and an Honorary Professor of Genetics at Vienna University. 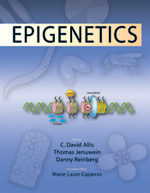 His seminal contributions to the field of epigenetics deal with the regulation of mammalian chromatin by histone methylation. Danny Reinberg is currently a Professor of Biochemistry at New York University School of Medicine. Before taking his present position, he was a Distinguished University Professor the University of Medicine and Dentistry of New Jersey-Robert Wood Johnson Medical School. Marie-Laure Caparros is a freelance writer and project manager specializing in epigenetics.